8:37 p.m.: This article has been updated with new information. A 19-year-old man is in hospital after being struck by a vehicle late Wednesday afternoon on South Street, immediately east of the Dalplex entrance. Halifax Regional Police Sgt. Gordon Graham said the pedestrian was leaving the Dalplex when he was struck while crossing a crosswalk. The driver was a Metro Transit supervisor in a company SUV. Traffic on South Street was barricaded in both directions for about a half-hour starting at 5:50 p.m. as police and emergency crews assessed the scene. 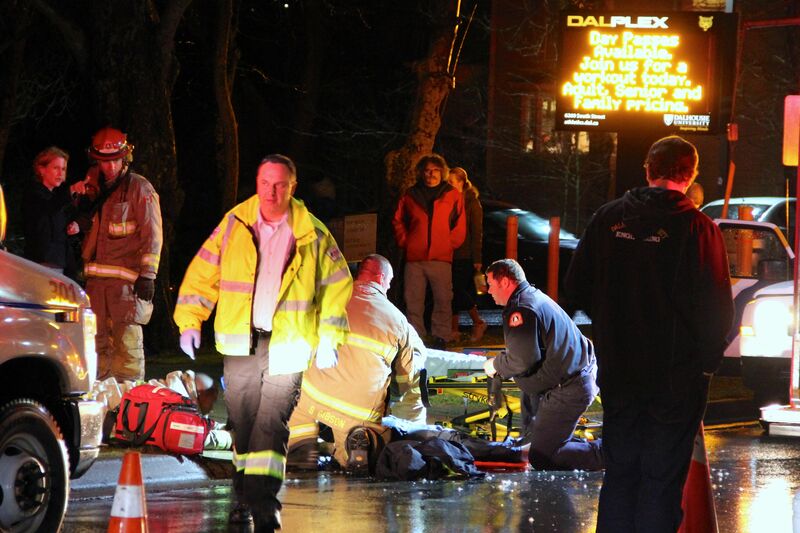 Only a day earlier, another pedestrian was hit on Dalhousie’s Studley campus. A 58-year-old man was hit by a vehicle while crossing the corner of Lemarchant Street and University Avenue after 9:45 p.m. Tuesday evening. The pedestrian sustained minor injuries. I’m surprised University students don’t get hit by cars on a regular basis. They disregard signs and traffic and just walk whenever.